After the so-called Tito-Stalin split that took place in 1948, the new Yugoslav People’s Army (JNA- Jugoslovenska Narodna Armija) found itself in a very serious situation in terms of acquiring modern military equipment. The JNA had been heavily dependent on Soviet military delivery and aid in armament and weapons, especially armor vehicles. In the 1950s, the situation with the acquisition of military technology significantly changed. This period is considered to be the ‘happier times’ of the JNA, because of a sudden inflow of new armored vehicles, mostly from the West. The West was initially in a dilemma whether to help the new communist Yugoslavia or not but by the end of 1950, the side arguing in favor of providing military assistance to Yugoslavia had prevailed. In the middle of 1951, a Yugoslav military delegation (led by General Koča Popović) visited the USA in order to achieve military cooperation between these two countries. These negotiations were successful and, shortly thereafter, several US military instructors arrived to help in training for the future equipment that would subsequently arrive. On the 14th of November 1951, an agreement for military aid was concluded (Military Assistance Pact). It was signed by Josif Broz Tito (Leader of Yugoslavia) and George Allen (American ambassador in Belgrade). With this contract, Yugoslavia was included in MDAP (Mutual Defence Aid Program). During the negotiations, the American Army wanted to get rid of older vehicles that were on stock first, but after some stressful and long negotiations, it was decided that the delivery would contain only this newer version. 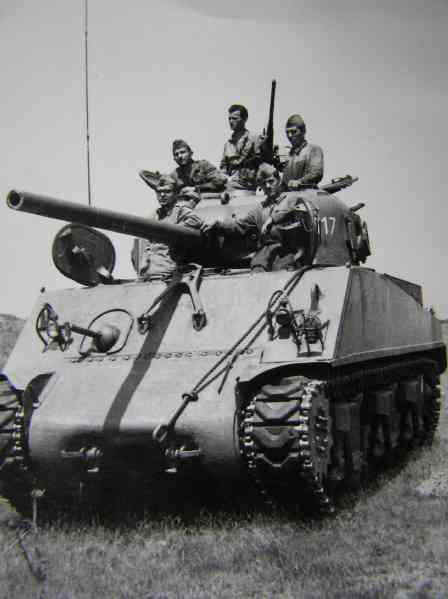 The ‘E4’ was a modernized and improved version of the M4A3 tank. It was essentially an M4A3(75) Wet Stowage with VVSS, up-gunned with a 76mm gun. The Yugoslav M4’s would be mostly used in military parades and for crew training in the following years up to the second half of the sixties. The first appearance of this tank in public was at a military parade held in Zagreb (May 1953). Due to obsolescence and lack of spare parts, which limited their operational use, it was foreseen by the Drvar-2 military plan to replace them with the Soviet T-54/55. After replacement, the Shermans were to be modified for other purposes (bridge carriers and engineering vehicles). 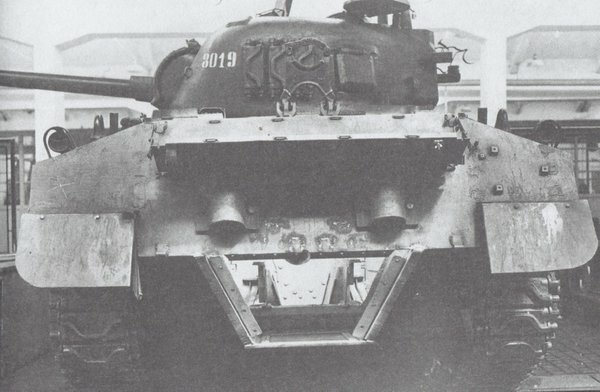 Unlike the T-34-85 (whose parts were manufactured by domestic factories and workshops and thus there was a real possibility of keeping them in operational use for a long time), M4 tanks were not used during the civil war in Yugoslavia in the early nineties, but they saw action in many Yugoslav and foreign war movies like Užička Republika (1974) and perhaps the most famous Kelly’s Heroes (1970). The JNA was obsessed with the production of its first domestic tanks. The construction of a new tank required a well-developed industry and also demanded a high number of educated and qualified personnel. Due to a bad economic situation, mostly due to the damage done to the industry and infrastructure during the war, production of a new tank was not realistic or possible in the near future. An attempt was made to find a compromise if the production of new tanks was not possible in the near future, then a solution may be to attempt to improve existing tanks. Several such projects were created during the 50’s and 60’s. The first project was the Vehicle A (5 built), then followed by the proposed Vehicle B (self-propelled gun armed with a 90 mm gun). A series of different prototypes followed next, the M-320, M-628, M-634 and the T-34D. All of these were based on the already existing tanks (T-34, M4, M47, and even T-54/55). Perhaps the strangest and unusual was the modification named SO-122, which was in principle an M4 armed with a large 122 mm gun and equipped with a Soviet engine, a combination from the East and West (ironically, the same as Yugoslavia of that time). 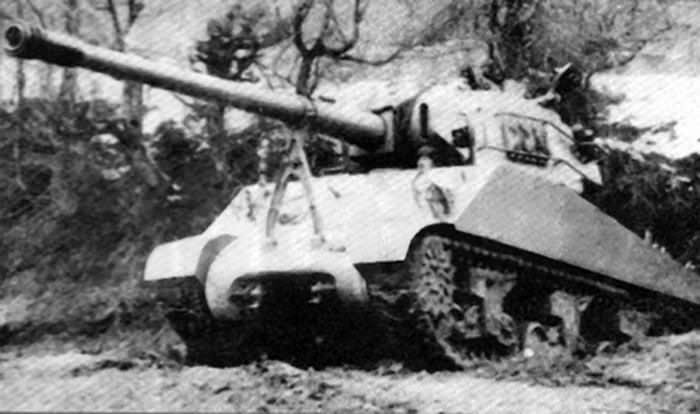 At the meeting of the Chief Military Expert Council held on the 4th of February 1956, it was decided to rearmed one Sherman (due to the obsolescence of M4 tanks) with the 122mm A-19 gun, and to test whether this modification was feasible and cost-effective at all. The idea was that, by installing a large caliber in the M4 tank chassis, it would extend its operational service life. At the same time, this would increase its firepower and allow it to deal with more modern tanks and to be used as a heavy fire support vehicle. The project design was assigned to the Military Technics Institute KoV (Vojno Tehnicki Institut KoV), and the head of the project was the Uprava Artiljerije. Fortunately for them, there was an independent earlier project with the goal to modify a few M4’s by installing a Russian V-2/2R engine. This helped to a certain extent to accelerate the development time and reduce costs. In August 1950, in Belgrade, a ‘machine bureau’ (Mašinski Biro) which consisted of 60 engineers and technicians was founded. Its primary function and purpose was to analyze the parts of the T-34-85 Soviet tank (the engine, gearbox and transmission were considered the most important) and, if possible, to reproduce them. If this task was successfully fulfilled, the next goal was to rebuild and produce this tank (the ‘Famos’ factory was selected for this job). By the end of 1957, both the engine and gearbox were successfully produced in some numbers. Some 71 new V-2 engines were built by the end of 1957, with 50 more planed by the end of 1959. The stronger V-2R (520 Hp) engine was built in limited numbers. In 1956, Famos factory engineers tested the installation of this engine on one M4 tank. The results showed that installation of a new engine was feasible, but there was a problem with overheating. Next year, several modifications were made to the engine but the overheating problem was still present. The tests continued for the next few years and, although slow, interest in this project was still significant. Around three or four M4s were equipped with the V-2 (under the code name M-634) and one with a V-2R engine. When designing the SO-122, beside the modified engine compartment, only the turret had to be completely rebuilt from scratch. The rest of the original M4 was unchanged. The work on the large tank turret equipped with 100 mm or 122 mm cannons started in the early sixties. Several designs were built and tested and great attention was paid to the design of the turret due to the new rear modified engine compartment. One of the most important requirements was that the new turret should have a full 360° rotation arc. In 1964, the 100 mm project was rejected because of the great price. Work on the 122 mm project (code-named SO-122) continued. The main gun was built using some parts taken from the T-54 gun (hydroelectric system and the breech lock) and had a muzzle brake installed. In order to avoid any greater damage to the gun during vehicle movement, a heavy travel lock for the main weapon was also added. The gun was built by Zenička Železara and the final assembly was done in the ‘Bratstvo’ workshop in Novi Travnik. Beside the main weapon, there is no information about the secondary armament (machine guns). The hull-mounted machine gun would have probably remained. Based on the picture of this vehicle, the design of the turret suggests that a second machine gun was planned, but this is only speculation at best. It was planned that all SO-122 would be equipped with the new domestic-built engine. Because the tests on the new V-2R engine were successful, a decision was made to use them instead for this modification. The crew would most likely have consisted of a gunner, a loader, a driver, a radio operator and the commander. The dimensions of this vehicle were similar to the original M4 tank. Due to the length of the 122 mm gun, it was certainly much longer than the original but the exact details are unknown. The American SCR-528 radio was replaced with a British SET-19WF with an operational range of 10-15 km. As the SO-122 project was conducted under a great deal of secrecy, only a small amount of information of its characteristics (armor, elevation etc.) and only a few photographs exist. When the complete prototype was ready, it was sent to Banja Luka and Nikinci for first field tests and, by the 1st of February 1965, they were completed. The results of these tests showed that the mobility characteristics of the original M4 tank (even with an increase in weight up to 33.5t) were almost unchanged. The top speed was increased up to 50 km/h but, on the other hand, the acceleration was reduced. The fuel consumption was also reduced from some 400-450 litres to 207-211 litres for 100 km. These modifications also influenced the increased the operational range up to 300 km. A big issue was the length of the main gun. More than 3 m long, this could cause some problems (possibly even damaging the gun) when moving on uneven ground and in operating in urban areas or thick forests. It was not recorded whether there were any structural problems when shooting the main gun, despite its greater weight and recoil. There were some issues with the turret ventilation and problems with the fumes that appeared in the turret during firing. These tests were considered relatively successful and that this modification was feasible and not overly complicated for production. A preliminary decision for the production of 100 SO-122 (or 96 depending on the sources) was made before these tests were even done. Unlike the prototype, it was planned that the production vehicles should use the original engine (gasoline Ford GAA V8), mostly in hope to start the production as soon as possible. The death of the Joseph Stalin (in 1953) and the gradual reconciliation of Yugoslavia and the Soviet Union in the late fifties, led to future negotiations of purchasing of new military equipment including modern tanks. New deliveries of more modern Soviet tanks also influenced the final decision for this project. As the number of modern tanks increased, there was really no point to continue working on the SO-122. After nearly 10 years of development and testing, in 1966, on the orders of the State Secretary for National Defense General Gošnjak, the SO-122 project was canceled. The works on similar projects using the T-34-85 were forbidden. Due the great secrecy of the project, the fate of the SO-122 prototype is unknown. The M1931/37 gun was designed primarily for the purpose of destroying enemy artillery at long distance. The gun itself was not new as it was designed in late 1927 and tested in October 1931. Production started in 1935 but, from 1938 on, the ML-20 carriage was used in combination with this gun. It was heavily used during the war. Modified versions were also used as the main armament on several Soviet armored vehicles like the IS series and the ISU-122. The ML-20 carriage (used for later built M31/37) had a modern split trail, small shield for crew protection, two steel wheels covered by solid rubber tires and a pair of two cylinder springs (horns) for a better gun barrel balance. The Yugoslav Partisan captured several ML-20 and A-19 guns from the Germans during the war. Germany had itself captured a number of these guns from the Russians (under the designation 12,2 cm Kanone 390/1(r)) and used them during the war in many different roles. Those guns that were recaptured by the Partisans were used as coastal guns guarding the shores of the Adriatic Sea. They were used in the fight against the Germans but, because of the lack of ammunition, parts, and adequate towing vehicles, their use was limited. After the war, in 1947, some 66 new 122mm M1931/37 guns were bought from the Soviet Union at a price of US$11,472 per unit. By decision of the JNA (Yugoslav People’s Army) military officials, 32 guns were given to the third Army, four guns were assigned to the First and Second Army, and 14 were kept in reserve. The remaining 12 were given to a special unit under a code name 8888-I. It was actually a secret code name for an operation helping with the rearmament of the Albanian army. The M1931/37 remained in use until the nineteen-nineties, up to the civil war in Yugoslavia. During 1992, all available 122 mm (A-19) guns were used by the Army of Republika Srpska (Bosnia and Herzegovina) under the new designation M-31/37B1 (equipped with modern wheels). They participated in heavy fighting in 1992 near Srebrenica. The last examples of the M-31/37B1 were destroyed in 1996/97. Crew 5 (Gunner, loader, driver, radio operator and commander). Oklopne jedinice na Jugoslovenskom ratištu, Bojan B. Dumitrijević i Dragan Savić, Institut za savremenu istoriju, Beograd 2011. Modernizacija i intervencija, Jugoslovenske oklopne jedinice 1945-2006, Institut za savremenu istoriju, Beograd 2010. Allied Artillery of World War Two, Ian V. Hogg, The Crowood Press 2001. Military Magazine ‘Arsenal’, Number 47 2011. Twentieth-Century Artillery, Ian Hogg, Amber Books 2000. Illustration of the SO-122 by Tank Encylopedia’s own David Bocquelet. How many rounds could this tank have carried? We don’t know. Not many though.